Retired space shuttle Endeavour went on display at the California Science Center in Los Angeles on Oct. 30, 2012, and remains a popular exhibit. Photo taken May 14, 2014. Endeavour, the fifth and final space shuttle to be built, was created after the space shuttle program's greatest tragedy. Congress authorized NASA to replace Challenger, which was lost shortly after liftoff in 1986. NASA used spare parts from its shuttle fleet to create the new orbiter. Endeavour flew into space 25 times. Among other career highlights, its crew members performed the first Hubble Space Telescope servicing mission. Endeavour also reached the Mir space station once and the International Space Station multiple times. Perhaps sensing an opportunity to get some positive press, NASA ran a competition for U.S. schools to name the next shuttle. About 6,000 schools participated in the contest, which set out several requirements for the name. Among other stipulations, the shuttle had to be named after an "exploratory or research sea vessel" and the name also needed to be easily understood in space. Almost one-third of the participating schools chose the same name: Endeavour. It was a British ship that was best known for its first voyage (1769-71) with James Cook as captain. On that voyage, Cook brought Endeavour to Tahiti to watch the transit of Venus across the sun. Other finalist names were Horizon and North Star; according to NASA, it was President George H.W. Bush that selected the winning name on advice from the NASA administrator. Two schools (Senatobia Middle School in Mississippi and Tallulah Falls School in Georgia) were chosen as the winners based on their essays. Construction on Endeavour commenced in 1987, using spare parts from Discovery and Atlantis. Final assembly finished in July 1990, and the shuttle was shipped to the Kennedy Space Center in May 1991 from its assembly location in Palmdale, Calif.
Current location: California Science Center in Los Angeles, Calif. Notable: Built after the Challenger tragedy of 1986. Flew into space 25 times, with notable missions including the first Hubble Space Telescope servicing mission and the first three-person spacewalk of the space shuttle program. Endeavour's first flight was a challenging one. The crew members of STS-49, when they rocketed to space on May 7, 1992, were supposed to capture a satellite that was stuck in the wrong orbit, rescue it and loft it again into space. Crew members reached the Intelsat VI satellite successfully, but ran into a snag when they needed to attach a "capture bar" onto the satellite to bring it into the shuttle. Dangling on the end of the Canadarm, Pierre Thuot tried to attach the bar to the satellite. But as he touched it, Intelsat drifted away. More attempts the next day were also unsuccessful. NASA then came up with a new, riskier procedure to bring the satellite into the payload bay. For the first time, three astronauts did a spacewalk at the same time. Thuot rode the Canadarm again as Richard Hieb and Thomas Akers attached themselves to the payload bay. Then, the crew members inside the shuttle maneuvered Atlantis to just below where Intelsat spun. Carefully, with Thuot giving hand gestures as instructions to the astronauts inside the shuttle, the Canadarm was maneuvered to a spot where Thuot, Hieb and Akers could all grasp the satellite and successfully install the capture bar. It was a remarkable maneuver considering how little room there was for error in moving the Canadarm and Thuot near the shuttle's payload bay. The astronauts equipped Intelsat VI with a new "kick motor" and sent it on its way. The communications satellite successfully entered geosynchronous orbit and started service in time for the 1992 Summer Olympics. Endeavour was also the shuttle that ferried the first Hubble Space Telescope repair crew. Astronauts on STS-61 fitted Hubble with adaptive optics to correct a faulty mirror, installed new solar arrays and swapped out other telescope components. The December 1993 mission had five spacewalks in five days, with more than 35 hours outside. NASA says it was one of the most challenging spacewalks in the history of the space program. The shuttle program is best remembered for launching satellites, visiting Mir and building the International Space Station. However, there were thousands upon thousands of hours of science performed during the program. Endeavour's crews took part in a lot of that. In 1994, Endeavour flew a pair of Space Radar Laboratory missions. NASA wanted to take high-quality radar images of the Earth to learn how the environment was changing, particularly focusing on those areas affected by climate change. The images also produced some unique applications. For example, researchers used pictures of Cambodia to track down ancient settlements near Angkor, whose temples date back to the ninth century. The space radar was able to peer past trees and other obstacles to see what lay underneath. In March 1995, Endeavour flew the Astro Observatory on STS-67 to look at more than 100 objects in ultraviolet light. Six months later, STS-69 crew members on Endeavour released Spartan, a payload that watched over the sun's outer atmosphere for two days in space before being retrieved. Endeavour also visited the Mir space station for a few days in 1998. STS-89's crew members were the first to reach Mir in a shuttle other than Atlantis. Endeavour had the honor of being the first shuttle to assemble the International Space Station. In December 1998, STS-88 rocketed to orbit in search of the Russian Zarya control module. On Dec. 6, just two days after launch, the astronauts mated Zarya with Unity, a connecting module built in the United States. Astronauts Jerry Ross and James Newman did three spacewalks to hook the two modules together, at which point the modules were turned on. Except for a shuttle radar topography mission done on STS-99, the rest of Endeavour's flights focused on building the station. Prior to the Columbia breakup that halted the program for two years, Endeavour's astronauts took on missions such as installing the Canadarm2 and adding more solar arrays to the station. Endeavour stayed on the sidelines for several years after the shuttle program returned to flight. Upgrades, which began in December 2003, included putting in a "glass cockpit" with more advanced electronics, and installing a new global positioning system. Endeavour next flew into space in August 2007, for STS-118. NASA was hitting the homestretch of space station construction at that point, but there was plenty of work available for all the shuttles. Notably, Endeavour's ISS missions included ferrying the Dextre robotics system, Japanese Kibo Logistics Module and Tranquility node into space, as well as equipment, connectors and parts. Endeavour's last space mission reached orbit May 16, 2011. STS-134 was commanded by Mark Kelly. His wife — Congress member Gabrielle Giffords — had been shot and seriously wounded in January during a reported assassination attempt. Giffords, who was still in the early stages of recovery, attended the launch. Crew members delivered some spare parts for Dextre and two S-band communication antennas, as well as the Alpha Magnetic Spectrometer. Endeavour's mission was the second-last of the shuttle program. Workers cut down hundreds of trees ahead of Endeavour's journey in October 2012. Still, the shuttle was a day late in arriving at the museum Oct. 14 as it took far longer than expected to maneuver the shuttle past poles, trees and other obstacles lining the streets. 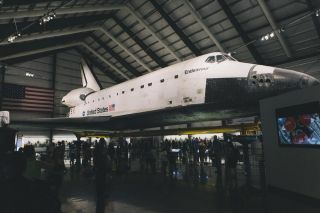 Endeavour will remain on display in the museum, only an hour's drive from Palmdale, where its journey to space began.